A human nose from the front. The visible part of the human nose is the protruding part of the face that bears the nostrils. The shape of the nose is determined by the nasal bones and the nasal cartilages, including the septal cartilage (which separates the nostrils) and the upper and lower lateral cartilages. On average the nose of a male is larger than that of a female. The nose has an area of specialised cells which are responsible for smelling (part of the olfactory system). Another function of the nose is the conditioning of inhaled air, warming it and making it more humid. Hairs inside the nose prevent large particles from entering the lungs. Sneezing is usually caused by foreign particles irritating the nasal mucosa, but can more rarely be caused by sudden exposure to bright light (called the photic sneeze reflex) or touching the external auditory canal. Sneezing can transmit infections, because it creates aerosols in which the droplets can harbour microbes. The nasal root is the top of the nose, forming an indentation at the suture where the nasal bones meet the frontal bone. The anterior nasal spine is the thin projection of bone at the midline on the lower nasal margin, holding the cartilaginous center of the nose. 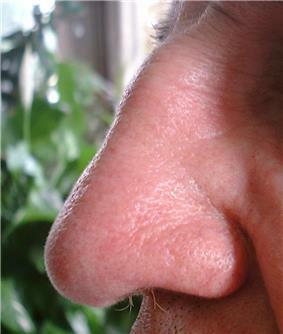 Adult humans have nasal hairs in the anterior nasal passage. One of the most common medical conditions involving the nose are nosebleeds (in medicine: epistaxis). Most of them occur in Kiesselbach's area (synonym: Little's area). Nasal congestion is a common symptom of infections or other inflammations of the nasal lining (rhinitis), such as in allergic rhinitis or vasomotor rhinitis (resulting from nasal spray abuse). Most of these conditions also cause anosmia, which is the medical term for a loss of smell. This may also occur in other conditions, for example following trauma, in Kallmann syndrome or Parkinson's disease. 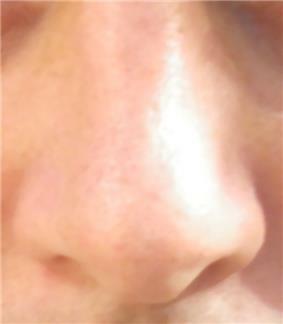 The nose is a common site of foreign bodies. The nose is susceptible to frostbite. Nasal flaring is a sign of respiratory distress that involves widening of the nostrils on inspiration. Because of the special nature of the blood supply to the human nose and surrounding area, it is possible for retrograde infections from the nasal area to spread to the brain. For this reason, the area from the corners of the mouth to the bridge of the nose, including the nose and maxilla, is known to doctors as the danger triangle of the face. Specific systemic diseases, infections or other conditions that may result in destruction of part of the nose (for example, the nasal bridge, or nasal septal perforation) are rhinophyma, skin cancer (for example, basal cell carcinoma), granulomatosis with polyangiitis, systemic lupus erythematosus, rheumatoid arthritis, tuberculosis, syphilis, leprosy and exposure to cocaine, chromium or toxins. The nose may be stimulated to grow in acromegaly. Some people choose to get rhinoplasty to change the aesthetic appearance of their nose. Nose piercings are also common, such as nostril, septum or bridge. In New Zealand, nose pressing ("hongi") is a traditional greeting amongst Maori people. However it is now generally confined to certain traditional celebrations. The Hanazuka monument enshrines the mutilated noses of at least 38,000 Koreans killed during the Japanese invasions of Korea from 1592 to 1598. The septal cartilage of the nose can be destroyed through repeated nasal inhalation of drugs such as cocaine. This in turn can lead to more widespread collapse of the nasal skeleton. Nose-picking is a common, mildly taboo habit. Medical risks include the spread of infections, nosebleeds and, rarely, self-induced perforation of the nasal septum. The wiping of the nose with the hand, commonly referred to as the "allergic salute", is also mildly taboo and can result in the spreading of infections as well. Habitual as well as fast or rough nose wiping may also result in a crease (known as a transverse nasal crease or groove) running across the nose, and can lead to permanent physical deformity observable in childhood and adulthood. Nose fetishism (or nasophilia) is the sexual fetish (or paraphilia) for the nose. The psychiatric condition of extreme nose picking is termed rhinotillexomania. Antisemitic propaganda often portrays Jewish people as having "Jewish noses": large and hooked. The term "Jewish nose" is controversial. In China and some other locations in East Asia, Westerners (Caucasians) are often designated as having "big" or "high" noses, due to the differences in shape and proportion between noses typical of Caucasians and those typical of Chinese. Clive Finlayson of the Gibraltar Museum said the large Neanderthal noses were an adaption to the cold, Todd C. Rae of the American Museum of Natural History said primate and arctic animal studies have shown sinus size reduction in areas of extreme cold rather than enlargement in accordance with Allen's rule. Therefore, Todd C. Rae concludes that the design of the large and prognathic Neanderthal nose was evolved for the hotter climate of the Middle East and was kept when the Neanderthals entered Europe. Miquel Hernández of the Department of Animal Biology at the University of Barcelona said the "high and narrow nose of Eskimos" and "Neanderthals" is an "adaption to a cold and dry environment", since it contributes to warming and moisturizing the air and the "recovery of heat and moisture from expired air". An article published in the speculative journal Medical Hypotheses suggested that the nose is an alteration of the angle of skull following human skeletal changes due to bipedalism. This changed the shape of the skull base causing, together with change in diet, a knock-on morphological reduction in the relative size of the maxillary and mandible and through this a "squeezing" of the protrusion of the most anterior parts of the face more forward and so increasing nose prominence and modifying its shape. The  The theory is not generally accepted by mainstream scholars of human evolution. Stephen Jay Gould has noted that larger noses are less neotenous, especially the large "Grecian" nose. Women have smaller noses than men due to not having "increased secretion of testosterone in adolescence" and smaller noses are considered more attractive on women. Werner syndrome, a condition that causes the appearance of premature aging, causes a "bird-like" appearance due to pinching of the nose while, conversely, Down syndrome, a neotenizing condition, causes flattening of the nose. ^ a b Jean-Baptiste de Panafieu, P. (2007). Evolution. Seven Stories Press, USA. ^ The "Jewish Nose" and Plastic Surgery: Origins and Implications Beth Preminger, Weill Medical College of Cornell University, New York, NY, JAMA. 2001;286:2161. ^ Hernández, M., Fox, C. L. and Garcia-Moro, C. (1997), Fueguian cranial morphology: The adaptation to a cold, harsh environment. American Journal of Physical Anthropology, 103: 103–117. ^ Gould, S.J. (1996). The mismeasure of man. Norton and Company: NY. ^ Fuente: Series de porcentajes obtenidas en un amplio estudio realizado por el CMD (Centro Médico Down) de la Fundación Catalana del Síndrome de Down, sobre 796 personas con SD. Estudio completo en Josep M. Corretger et al (2005). Síndrome de Down: Aspectos médicos actuales. Ed. Masson, para la Fundación Catalana del Síndrome de Down. ISBN 84-458-1504-0. Pag. 24-32.